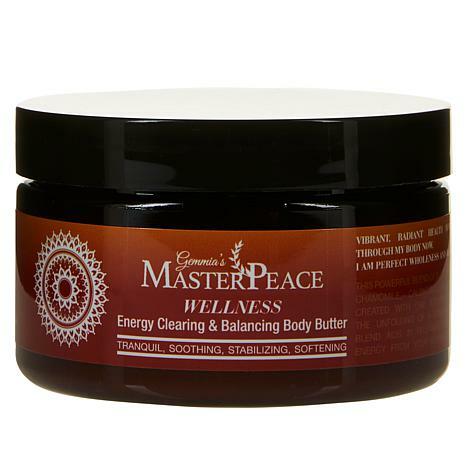 MasterPeace Wellness Body Butter - 4 fl. oz. 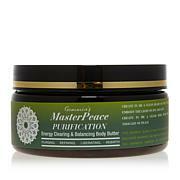 MasterPeace Peace and Calm Body Butter - 4 fl. oz. Luxurious blend of exotic oils, butters and other key ingredients helps dry skin become silky-smooth, hydrated and younger-looking. Ingredients: INGREDIENTS: Water/Aqua/Eau, Prunus Amygdalus Dulcis (Sweet Almond) Oil, Isopropyl Palmitate, Helianthus Annuus (Sunflower) Seed Oil, Propanediol, Cetearyl Olivate, Butyrospermum Parkii (Shea) Butter, Sorbitan Olivate, Cetearyl Alcohol, Palmitic Acid, Stearic Acid, Glyceryl Stearate, Fragrance/Parfum, Helianthus Annuus (Sunflower) Seed Extract, Gnaphalium Leontopodium Flower Extract, Humulus Lupulus (Hops) Flower Extract, Artemisia Vulgaris Extract, Eucalyptus Globulus Leaf Oil, Aloe Barbadensis Leaf Juice, Cocos Nucifera (Coconut) Oil, Macadamia Ternifolia Seed Oil, Persea Gratissima (Avocado) Oil, Sodium Hyaluronate, Tocopherol, Camphor, Sorbitan Stearate, Sorbityl Laurate, Glycerin, Butylene Glycol, Decylene Glycol, Caprylyl Glycol, Phenoxyethanol, Ethylhexylglycerin, Benzyl Salicylate, Eugenol, Linalool, Amyl Cinnamal, Hydroxycitronellal, Butylphenyl Methylpropional, Hydroxyisohexyl 3-Cyclohexene Carboxaldehyde, Alpha-Isomethyl Ionone.